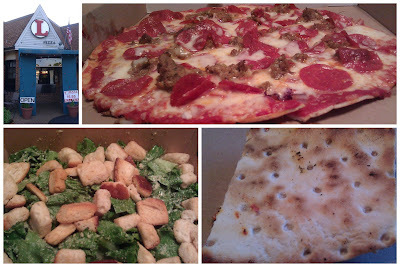 The Pizza Files: Red-L Pizza June 2011. The Binge 2011 stop 5. Just a small red dot on Google Maps. With some arens to do after work I pulled up Google Maps, narrowed it down to the area I would be going and type pizza into the search box and a small red dot caught my eye. I put the curser over it and it said "Red-L Pizza". I had never heard of it, perfect. I ordered a Red-L Caesar salad and for pizza I got 12" with pepperoni, meat loaf and onions. The cheese was a House blend, and when asked I was told it was mozzarella and provolone cheeses. The crust was of the thin St Louis Style. The pizza and salad were both great. I'll be back. The Red-L you will notice from the photo is just that, a red L. They are a carry out only joint, but they do have some outside seating, although it doesn't appear they have table service. The Red-L can be a little hard to find the first time so keep that in mind.